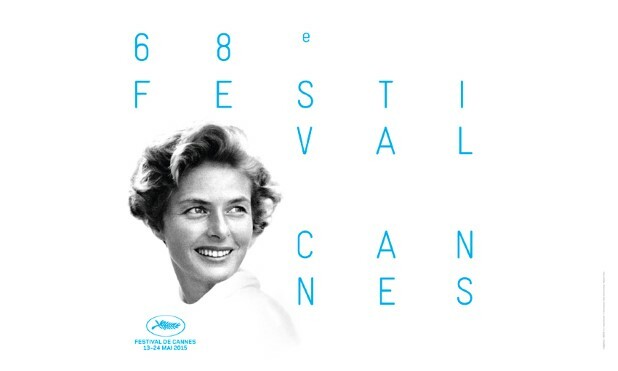 The 68th Festival de Cannes (13-24 May 2015) has chosen to pay tribute to Ingrid Bergman with this year’s poster, following on from Marcello Mastroianni in 2014. Hollywood star Ingrid Bergman was a modern icon, an emancipated woman, an intrepid actress, and a figurehead for the new realism. She changed roles and adoptive countries as the mood took her, but never lost sight of her quintessential grace and simplicity. This year’s poster captures the actress, who worked with Alfred Hitchcock, Roberto Rossellini and Ingmar Bergman, and starred opposite Cary Grant, Humphrey Bogart and Gregory Peck, in all her beauty, her face lit up by a calm serenity that seems to herald a promising future. Based on a photograph by David Seymour, co-founder of Magnum Agency, Hervé Chigioni, who also created for last year’s remarkable Festival poster, was once again behind this year’s image, with his graphic designer Gilles Frappier. He has also produced an animated film based on the visual, featuring a remix of the Festival’s theme music, “The Carnival of the Animals” by Camille Saint-Saëns, arranged by two Swedish musicians, Patrik Andersson and Andreas Söderström. And the tributes will not end there. Ingrid Bergman, in Her Own Words‏, a documentary by Stig Björkman (the author of books and documentaries on Woody Allen and Ingmar Bergman) will also be screened as part of the Cannes Classics. Finally, the Festival de Cannes will also be associated with the ‘Ingrid Bergman Tribute’ to be organised next September by Isabella Rossellini, to celebrate the centenary of her mother’s birth. The show, directed by Guido Torlonia and Ludovica Damiani, will be based on the star’s autobiography and her correspondence with Roberto Rossellini. It will be performed in the five key cities in Ingrid Bergman’s life: Stockholm, Rome, Paris, London and New York, and will feature, alongside Isabella Rossellini, Jeremy Irons, Fanny Ardant, Christian De Sica and several other actors. The show’s cast will be announced at next Festival. The 68th Festival de Cannes will take place from 13 to 24 May 2015. The Jury will be presided by the American directors Joel Coen and Ethan Coen. The Official Selection will be announced on Thursday 16th April. Cannes Review: ‘Amnesia’ | Who Deals With the Memories of the Holocaust Better…The Disgusted Runaway or Those Who Stayed to Rebuild Germany?